Nick Gordon is a New York City area based actor/singer with a Bachelors degree in Vocal Performance from Bowling Green State University and a Masters degree in Vocal Performance and Vocal Pedagogy from New York University. He has been singing barbershop music for over 14 years, winning the International Collegiate Contest with Prestige in 2011. He currently sings baritone in the current 5th place international medalist quartet, Quorum. Melody Hine has been barbershopping since before she was born due to her parents being so involved in the organizations. She graduated from the University of Georgia in 2015 with a Bachelor's Degree in Music Education, after which her work adventures took her to Epcot at Walt Disney World and the Hogwarts Express at Universal Studios. She now lives in Atlanta, GA and teaches choir at Duluth Middle School. Cy currently works as an educator in the Cincinnati area, teaching musical theater to students at Butler Tech. He recently moved to Ohio after living and working in New York City for nearly a decade. While in NYC, Cy worked as a professional actor, producer, special events coordinator, and creative director. As a professional actor, Cy has performed across the world in many Broadway and Disney Productions. Cy holds a BFA from Brigham Young University where he graduated with a Music, Dance and Theater degree with an emphasis in Music Education. Fleet Street is a barbershop quartet based out of St. Louis, MO. 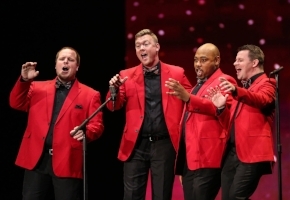 All four are members of the 4x international chorus champions, the Ambassadors of Harmony. while all relatively young singers, they have sung in 19 previous quartets before coming together as this foursome. Being very involved in youth singing, they travel the country as section leaders and directors for various youth in harmony camps. They are the 2018 Central States District Quartet Champions. Adrenaline is a female barbershop quartet hailing from Tennessee, Nebraska, New York, and California. They represent Sweet Adelines International as the 2017 Rising Star Champions! They took home the gold in August of 2017 in College Park, MD. Maggie McAlexander (t), Amanda Pitts (l), Jadyn Johnson (bt), and Sara Littlefield (bs) formed Adrenaline in the fall of 2016. The foursome first sang together in January of 2017. They are thrilled for the future and hope to meet you on their journey!